The Police are intensifying their efforts to determine the credibility of an informant who accused members of the JLP of taking out a hit on the life of Opposition Leader, Andrew Holness. In his statement to the Police, the informant accused members of the Labour party of paying money and supplying guns to kill the JLP leader and General Secretary. The complainant also stated that he was in the company of men who he accused of being contract killers when they picked up the money and guns at a location in St. Andrew. The statement given to the Police by the Informant has resulted in security being boosted around Mr. Holness and JLP General Secretary, Dr. Horace Chang. Checks by the Police have disclosed that the person who gave the statement has in the past been found guilty of obtaining money by false pretence. It's understood that a few years ago he was also convicted in relation to an allegation that a dangerous substance was in a public building in Downtown Kingston. That allegation turned out to be untrue. Police sources say the informant was to be subjected to a polygraph test on Tuesday but it was postponed. It's understood that the Police High Command is preparing to issue a statement which will raise doubt about the credibility of the informant. Jamaica has a NEW Prime Minister, Bruce Golding OUT! Andrew Holness in! Opposition leader, Andrew Holness, Andrew Holness has shrugged of news about a million-dollar hit on his life as a probable case of classic bad mind. Holness was speaking recently at a political event in Papine when he admitted that security forces are currently investigating information surrounding the alleged 'hit'. He confessed to being a man who prays each night and assured the crowd that he was confident, calm and unafraid. He told the audience, "When you have a family as big as the Jamaica Labour Party nobody can trouble you," Holness joked. The JLP leader speculated that the alleged plot to assassinate him may be linked to his favourable poll numbers. Outgoing prime minister, Bruce Golding will this afternoon tender his resignation to Governor General Sir Patrick Allen, paving the way for Andrew Holness to become the head of government. Mr Holness, who was the education minister, will be installed as the country's ninth prime minister during an inauguration ceremony at King’s House at 3:30 this afternoon. At 39 years old, Mr Holness will become the youngest person to head the Office of the Prime Minister in Jamaica and among the youngest in the world to lead a country. Mr Holness, who received the overwhelming support of the Jamaica Labour Party’s top brass, including the support of the outgoing JLP leader and prime minister Mr Golding, has promised continuity of some of the economic programmes and policies pioneered by his predecessor. While addressing members of the private sector and diplomatic community on the weekend, Mr Holness emphasised that he was also prepared to make tough decisions to drive the development the country needs at this time. Prime Minister Golding, who announced only a month ago that he would not seek re-election as JLP leader at the party’s November 19 annual conference, was often criticised by pundits for wavering on tough decisions. Mr Golding has cited that events over the past four years had taken a toll on his leadership. Earlier this week, it was announced that the date of his departure would be brought forward to October 23. In his final address to the nation last night, Prime Minister Bruce Golding said he was satisfied that the country has a foundation on which it can achieve economic growth. Mr Golding, who said he was honoured to be allowed to lead the country through one its most difficult periods, urged Jamaicans to be proud of the progress made in reforming the structures of governance. He said the reform programme will be continued by the Andrew Holness Government and expressed confidence in the ability of the incoming Prime Minister to effectively manage the country. He urged Jamaicans to support the Holness administration as he noted that unity will be critical to the success of the programmes and policies the Government will pursue. 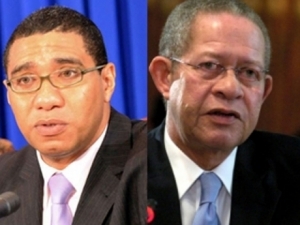 Outgoing Prime Minister Bruce Golding says he has asked his successor Andrew Holness to continue the reform of governance in the country in keeping with the commitment the ruling Jamaica Labour Party (JLP) made to the electorate during the campaign of the 2007 general election. In his last address to the nation as head of the government on Saturday night, Prime Minister Golding said his regret is that “despite the considerable work that has been done, there are still critical reform initiatives yet to be fully implemented. “I have made one request of Andrew and that is that he does everything possible to complete the reform programme which is a commitment we made to the people of Jamaica during the last elections,” he said, adding that the emergence of a new leader brings with it new hope and great expectations. “That hope must be used to inspire us to a renewed effort by each of us, every single Jamaican, to do our part in building this nation, in overcoming the many challenges that confront us. “No government, whether led by me, Andrew or anyone else, can do it alone. Our chances of success lie in our ability to set aside our differences, to find unity despite our diversity and to coalesce behind a common set of objectives and the strategies to achieve them,” Golding, 63, said in his brief address. “Our competitive political process does not encourage that but it can and must be made to facilitate it. Vested interests must be submerged into the common interest so that we can move forward, in single formation with a single purpose, to make Jamaica a better place for all of us to live. We must march into the future, not let the future take us by surprise,” he added. Golding said that Holness, who will become one of the youngest world leaders, brings tremendous ability to the job, as demonstrated in his work as Education Minister. Golding, who steps down as Jamaica’s eighth prime minister on Sunday, said he is confident that the road Jamaica has been amid the “turbulence of the world” will see it through into a better future. “The journey may be long and harsh but we will find the fortitude, that extra energy, that capacity, once we are confident that our compass is set on the right track and that we are tackling the journey together. “As I leave office, my heart salutes Jamaica, proud, free and well positioned to be triumphant,” he said, adding “I leave this job with strong emotions”. Ain't no body gots time for waitin to see. We're seeing all our lives, no like for the pictures. We watch this picture close that it stay focused, eh? It don't stay on track, it shall be delete. ! I'm going to ask my family if I'm half related to this man so I can help support Jamaica with my imagination but I'wont disowned P.J.Patterson. More power to the Jam downs its going to be a challenging road ahead.So give the man a chance and lets see what he could do.Lets not jump to conclusion. You must be a total idiot, where does the skin color. Comes in? You tell em Connie, nuh because you shave your pumpum doan mean you can't be the PM Girlfriend. It look like a change for the better. We look forward to getting positive updates. Half empty glass thinkers instead of half full. Pure negative thinking. listen to the smart ones and learn instead of talking nonesense. And if you have a good party then do your part to help. Don't complain. EEEHHHH>>>>>what happen to the Rasta Man Government? other wise known as the PPP>>>Jamaica first political party Started by the HON.MARCUS GARVEY? It seems all of the have to be light skinned to be in power or is it just the white supremacy governing the affairs of AFRICANS by the house slave of similar decent. SMH DEM A ROAST BREAD FRUIT TO HOW ME SEE IT. If you bleach or light skin you would be the prime minister of jamaica .jamaicans vote for light skin people.